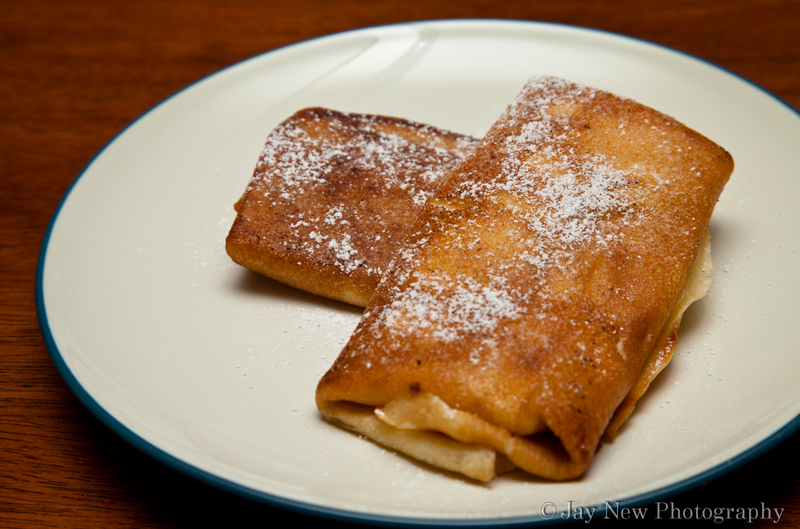 A Blintz is a thin crepe where sometimes yeast may be used. The Blintz has both cultural and religious significance, for many people. For example, the early Slavic peoples of pre-Christian times used the round “Blini” as their symbol for the sun and would prepare it at the end of winter to honor the rebirth of the new sun. They also are made to commemorate wakes for the recently deceased. Blintzes first popularized in the United States by Jewish immigrants, as part of their cuisine. They do not have any specific religious rites in Judaism but are tasty treats that are often stuffed with cheese filling and fried with oil and served on holidays like Chanukah and Shavuot. The first time I was introduced to this dish, was by my husband’s Grandfather Edward. Grandpa Edward is the most interesting, funny and loving man. He was born in 1913 in Poland. When he was 13 years old, he arrived, by way of Ellis Island, to the United States. He often jokes that he thought his father, who was already in the United States, was not going to collect him and his mother because it was a busy day at his Harlem Butcher Shop. He would tell me about how the Immigration Officer had changed his name to make it more understandable. Grandpa Edward grew up living the American dream. He loves music and on the drop of the hat, will belt out a tune..adding his own signature lyrics “doe di oh do.” He is even a World War II Veteran who fought during D-Day. He often tells about the draft and stories of the war. He is 98 years old and as strong and as witty as ever! Every Wednesday, my husband and I go for breakfast with Grandpa Edward. Wednesdays are Grandpa day. We pick him up and take him to our favorite diner where he gets his usual eggs easy with fries, coffee and half and half—with the meal. Once in a while, he changes his order up and orders Cheese Blintzes. It is one of his favorite meals. I decided to try my hand at making them, just for him. It turned out wonderfully and I loved the look on his face when I told him what I had made for him. Grandpa always appreciates it, when I bring him my homemade treats. I love him very much. For ease, I used a standard crepe recipe. I hope you enjoy this recipe as much as we did. Combine ingredients for crepe in a blender and blend until smooth. When you have finished making crepes, combine ingredients for cheese filling. Melt 1 tablespoon of butter on medium high heat. Fill crepes with cheese mixture by placing a portion of cheese filling in the center of the crepe, fold opposite sides of the crepe over the cheese and place formed Blintz into frying pan with melted butter. Fry until golden brown, both sides of the crepe. I love you for honoring Ed in such an endearing way.. He is a wonderful man and I’m so happy you have been able to get to know him. Make him potato Kugel and watch his eyes open wide..ingredients are much like Latkes, but made in a square pan …taste is different and easier than making individual pancakes. Its on my “to do” list 🙂 I have to make him Latkes first. He specifically mentioned he wanted them lol. I make him a lot of “apple-plause” though. lol. He is a wonderful man and deserves the best!! I enjoyed reading a little bit about your family. You have some deep NY roots! Love the recipe too, no surprise there! I love listening to his stories 🙂 Although his memory is sometimes faulty, he is is still, as he says: “as sharp as a matzo ball.” At 98 years old, he still comes up with the greatest one-liners lol. Too bad I can’t get him to tweet them! Blintzes are great for weekend eating with family and the fillings are endless. Think I may make these this evening. Yum! I hope you all enjoy! Can you believe I’ve never had a cheese blintze before? So these definitely look delish to me! And I love the story about your grandfather.. love it. I had never even heard of them until I met Grandpa 🙂 You would definitely love him 🙂 He is full of personality. Love the story. Next time you make cheese blintzes, try it with Farmers Cheese. You can pick it up at Cherry Valley. Its a wonderful flavor and you may be able to eliminate extra ingredients. Good luck! Yes, I know that most recipes call for Farmer’s Cheese but I had some cream cheese that I wanted to use up 🙂 That is why I used cream cheese vs purchasing Farmer’s cheese. Plus I only make 6 Blintzes 🙂 as Jason and I are not big on cheese fillings and I was just really making this for Grandpa. I love cheese blintzes! When I was little my mother used to make a blintz souffle for the holidays. I’ve never tried making them from scratch. Souffle?! That is one technique I am dying to try 🙂 Sounds difficult but I am hoping it is like making crepes, not too difficult, just need confidence. Thank you for visiting!! This looks great, I have just bought a crepe pan so will have to try this out. Congrats on the new Crepe pan! I definitely want one (when I have a bigger kitchen) 🙂 I can’t wait to find out if you liked this recipe! 🙂 I love his smiles whenever he sees us and when I bring treats like this for him. I own him some Latkas though. Now that the weather is cooled, I can stand to fry foods, in the kitchen a bit.